“Oh What a Night”, “Sherry Baby”, “Walk Like a Man”, “Big Girl’s Don’t Cry”, these electrifying Broadway smash hits bring non-stop energy, incredible talent and unlimited excitement to the New Covenant United Methodist Church stage! 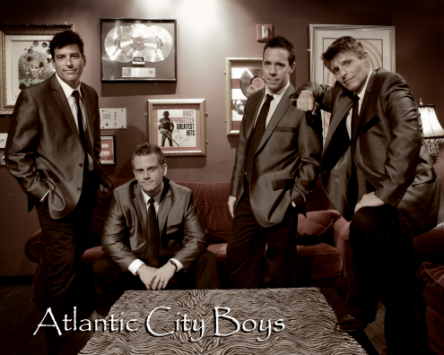 Lending their world class vocals to the rock-n-roll harmonies of the 60’s, The Atlantic City Boys will have you reliving the smooth street corner harmonies and non-stop hits of one of the world’s most memorable singing sensation groups of all time “The Four Seasons.” These four talented, dynamic male lead vocalists, backed by an equally accomplished live band, will take you on an exhilarating musical trip down memory lane that you will never forget! Their are two shows on Friday night. The first starting at 5:00 and the next starting at 8:00.